Legal Expert Connections, Inc. is a national legal marketing agency focused on business development in the insurance defense and employment defense markets. We have assisted more than 150 insurance defense law firms in 36 states with marketing and business development campaigns. If you are asking yourself, "How can I get on insurance panels as panel counsel?" we can help. We maintain a proprietary database of more than 2,000 internal records documenting the law firm hiring manager for panel counsel programs at Property & Casualty insurance carriers, third party administrators, retailers, hospitality companies and other self-insured entities. You can accelerate your business development efforts when we do the time-consuming research to identify prospective clients. We work primarily on a project or monthly retainer basis to help law firm managing partners and marketing committee members get their law firm front of managers for insurance panels. Our services are ideal for law firms with 5-35 attorneys that do not have an in-house marketing department. Click on the link to download our Insurance Defense Marketing Brochure. Click on the link to download the latest issue of The Panelist, a newsletter for insurance defense law firms. New revenue is our goal for you. We look for ways to generate more business from your existing accounts, put you in front of your target audience through consistent marketing communications, generate leads online, build your referral network, and more. One of our clients recently wrote to tell us, "I wanted to directly thank you for your assistance, as I am 100% positive that we wouldn't have obtained this carrier client without you." Margaret Grisdela, President and Founder, is also the author of “Courting Your Clients: The Essential Guide to Legal Marketing.” View Margaret’s background and connect on LinkedIn. Legal Expert Connections works with law firms across the country. 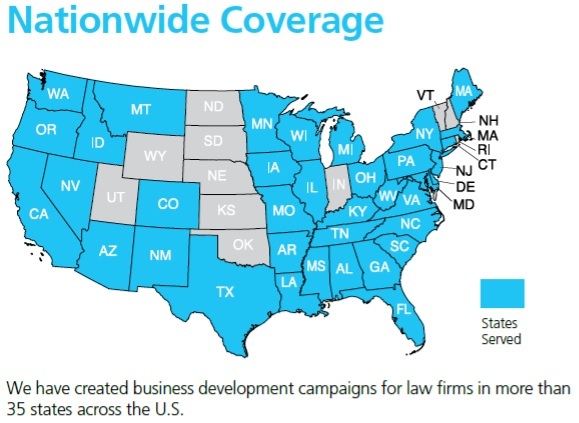 We have helped law firms conduct business development campaigns targeting insurance panels in more than 35 states, as shown on the map below. We are constantly talking to insurance defense managing partners and practice area chairs from coast to coast, and understand the competitive pressures facing law firms that want to protect the business they have while also attracting new clients. If your insurance defense law firm is asking how you can get on more insurance panels, give us a call. We have helped more than 150 insurance defense law firms in 36 states pursue new insurance panel counsel clients. We are the leading U.S. legal marketing agency specializing in the insurance defense market. We know the panel counsel process and can accelerate your business development efforts by identifying who you need to contact. Contact Margaret Grisdela at 1-866-417-7025 or via email. We will discuss your business development goals, review your current marketing activities, and talk about how Legal Expert Connections, Inc. might be of service to you. Thanks for your consideration!